Magical Pyramids gives your child unlimited possibilities to explore her or his creativity, or to arrange the triangles in predetermined patterns. 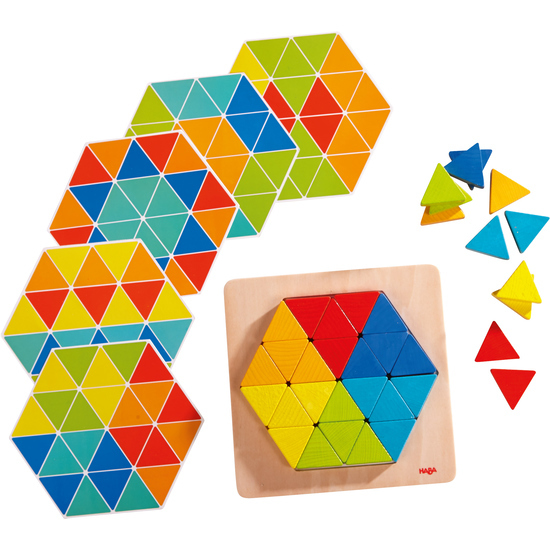 The 36 wooden triangles in 6 brilliant colors are laid in the wooden frame board, and can be rearranged endlessly. Whether according to pattern or personal design, fascinating fun is guaranteed! Contents: 1 frame board, 36 pyramids, 6 two-sided pattern templates.